Playing tenor, alto, soprano saxophones; flute, alto flute, and spoken word, Katisse Buckingham endevors to break down barriers between musical genres and has always resonated with Duke Ellington’s famous quote, “There are two kinds of music- good music, and the other kind”. 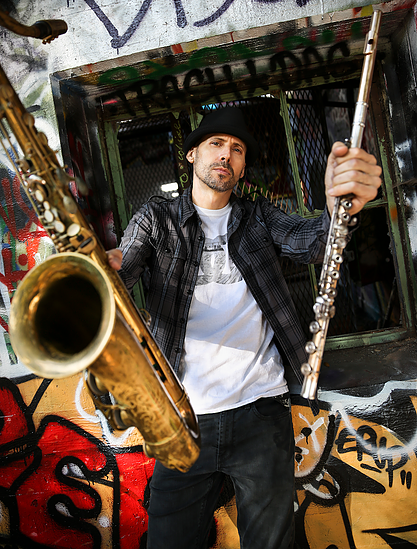 Growing up in Los Angeles, he cites Miles Davis, Run DMC, James Taylor, Malcolm Mclaren, Cachao, AC/DC, and Weather Report as equally important early influences. Katisse attended LACHSA and The Grove School of Music where he studied with multi Grammy winner, Rob McConnell. He also studied extensively with woodwind master, Bill Green. Katisse’s virtuosity and versatility makes him an in-demand musician on the “Hit” list of many high profile recording artists. He’s shared the stage and/or recorded with Yellowjackets, Prince, Billy Childs, Dr. Dre, Herbie Hancock, Roy Ayers, Andy Summers, Zawinul Legacy Band, Airto & Flora Purim, LA Guitar Quartet, Brian Auger, Amos Lee, Strunz & Farah, Colin Hay, Poncho Sanchez, Don Grusin, Pete Yorn, and Vanessa Paradis, among many others. He has played on numerous films including the “Jazz Flute” scene for the Will Ferrell film, Anchorman- The Legend of Ron Burgundy, the Golden Globe winning score to the Robert Redford film, All Is Lost, and is a featured soloist on the Universal Pictures animated film, Minions. Katisse is also an adjuct facullty member of Cal State University Northridge.